Linda Rawlins is an American writer of mystery fiction best known for her Misty Point Mystery Series; Misty Manor, Misty Point, and Misty Winter. She is also the author of the Rocky Meadow mysteries including The Bench, Fatal Breach and Sacred Gold. She loved to read as a child and started writing her first mystery novel in fifth grade. She then went on to study science, medicine and literature, eventually graduating medical school and establishing her career in medicine. Linda Rawlins lives in New Jersey with her husband, her family and spoiled pets. She loves spending time at the beach as well as visiting the mountains of Vermont. She is an active member of Mystery Writers of America as well as the 2018 VP of Sisters in Crime. Click Here for Upcoming Appearances & Booksignings! Tragedy befalls the town of Misty Point when local veterinarian, Dr. Arnie Stokes, is shot at the Hand in Paws Animal Clinic. The investigation leads the Misty Point Police Department directly to Megan Stanford who has now inherited ownership of the grant that has continued to keep the clinic running. When thefts of drugs and medical supplies are uncovered, the attacks appear to be coordinated with other animal shelters in the area. 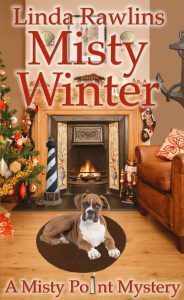 As Christmas approaches, Megan, Nick and her friends look to keep the spirit of the holiday alive by restarting the town traditions and hosting a fundraiser for the misplaced animals, two of which Megan reluctantly agrees to foster. With the investigation and festivities consuming Megan’s time, she is introduced to the mysterious, handsome Jonathan Brandon Carter who will serve as the future attorney for her estate. The fate of the shelter and employees are at risk unless Megan and her friends can catch a ruthless criminal before he strikes again. Click here to order Linda Rawlins’s latest mystery, and get in the spirit today! Order all of the exciting adventures today! Sign Up for the Linda Rawlins Mailing List today for the latest in new releases, extra content, contests, book-signings, and more!